Deep Slough Reservoir is located along Ward Creek between Ward Lake and Ward Creek Reservoir on the southern slopes of the Grand Mesa National Forest. The entire area is part of the Ward Nordic Area. 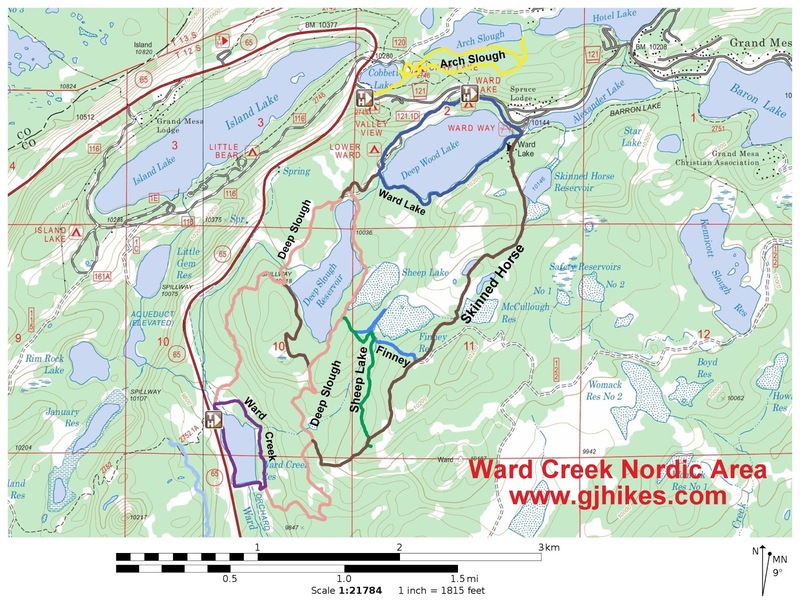 Unlike the Skyway and County Line Nordic areas, with their gentle hills the Ward Lake area is far from flat. The elevation change on this trail measured more than 300 feet. 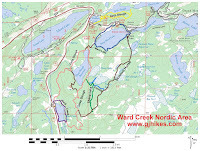 The Ward trail is the only trail in the area that is groomed. Most of the other trails in the area connect to the Ward trail in at least one or more spots. For this outing I followed the Ward trail from the trailhead around the east side of Ward Creek Reservoir. The trail had been freshly groomed so I stayed as far to the opposite side of the classic ski tracks as I could get. The trail followed along through the trees on the east side of the reservoir until it reached the dam. From this point the trail turned away from the reservoir and began climbing up towards Deep Slough Reservoir and Ward Lake. It seemed that most of the trail was nestled within the thick stands of spruce and aspen trees but there were a few spots where it broke out into the open. Just under 2 miles from the trailhead the East Ward trail branches off to the left and heads around the east side of Deep Slough Reservoir. East Ward trail is ungroomed. Most of the tracks that had already been made were from cross country skiers. There was one set of snowshoe tracks off to the side that appeared to be from a solitary hiker. I followed the snowshoe tracks, for the most part, to preserve the ski trail. There were a couple of spots where the trail squeezed down so much that it was too narrow for two sets of tracks. Those areas were pretty short though so it wasn't that big of a deal. Deep Slough Reservoir quickly came into view on the west side of the trail. After about a quarter mile the trail began following the west shore of Sheep Reservoir. The East Ward trail met back up with the Ward trail at the north end of Deep Slough Reservoir. This area was completely exposed to the elements. Lucky for me there was only a little breeze blowing at the time. I followed the Ward trail as it headed back towards Ward Creek Reservoir on the west side of Deep Slough Reservoir until I came to the Wild trail. I could have followed the well groomed Ward trail all the way back but the Wild trail sounded a little more adventuresome. The Wild trail seemed aptly named. It was a lot narrower and I didn't notice any blue diamond markers. It was the first time that I had gone this route and I don't know how well I would have done if there weren't already plenty of tracks to follow. This section of trail had a few pretty steep sections and I was glad that I was going in the downhill direction. The Wild trail turned out to have a big fun factor for me. The Deep Slough Reservoir requires a lot more effort than the trails on top of the mesa at the Skyway and County Line Nordic areas. Most of the climbing in elevation that I did going in the direction that I chose occurred while I was on the groomed portion of the trail so overall it seemed to only require a moderate amount of effort. Whichever way you go I don't think you will be disappointed. If you would like to see it for yourself then all you have to do is 'Take a hike'.